You can access it by going to the bank's website at sbsavings.bank, also showing here at the top of the screen. You will click on the drop down arrow located below 'login to my' and select business online banking. 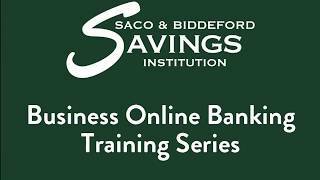 You could access the Saco & Biddeford Savings business online baking site directly by typing sbsavings.ebanking-services.com into your browser. The address is also listed in the top example on this slide. It will also work as a direct link so feel free to save it as a shortcut or in your favorites. You are now at the login screen This is where you enter the company ID and your user ID. Please note that your user ID is the same one you have in today's system. When you enter your login credentials a one-time security code screen, formerly known as one time pin, will be presented. After clicking the continue with the security code button shown on the previous slide, you'll be presented with an option to complete the one-time security process either by phone call or text message. If you choose to receive the code by phone, the code will be presented on your screen. You will receive a phone call where you will be asked to input the code from your screen and if the code is accepted, click the phone call completed button. If you choose to receive the code via text message, verify your text capable phone number and click the send text message button. Once you have received a one-time security code via text message, you can type in the code and hit the submit button. Enter your temporary password and click on 'Sign In.' You will then be prompted to enter a new password. Here on the screen you can see that we have Saco & Biddeford savings welcome page that you will see after you have successfully logged into business online banking. The Welcome page offers information links and tasks are easily accessible and contained in various panels. Each user may customize panels based on your needs. It's very easy to add customize and remove the available panels. For this webinar I will be using a demonstration environment. At this time I will bring up the demonstration environment. Here you can see that we have our welcome page. Here we have the demonstration site that we'll be using for today's session. When you first log in your welcome page will only contain the standard panel. Add info action is used to customize what panels you would like to view on your welcome page. First we're going to go to add info panels and take a look at the available panel. Here we have a list of the panels that are available. At the bottom of the screen we can scroll through the panels that are available. We are going to add a panel today. The panel that we're going to add is the important account balances. The important account balances panel allows you to add as many of those panels as you would like. So first we're going to start off by adding one, so we'll click on add now, and we can click on dashboard or we can go up to the top of the navigation bar and click on welcome. It'll take us back to our welcome page. And I have my important account balances panel here, and I also have one here. So let's first go in and take a look. We're going to edit the accounts this displayed here. When you first add this panel you will not have any accounts there so you'll need to go in and add the accounts. Here's our account types checking, saving,s certificate of deposit, and loans. You can select up to seven accounts for each account type and you just go in and select accounts that you want to add in this panel. Click on save, and we'll click on dashboard. Let's take it back to our welcome page. On the Welcome page here you can see the important account balances. We can click on available balance. This brings up the available balance and accessible balance. We can also click on the hypertext link that has the last four digits of the account number. And this will bring up the account activity for you. We're also able to minimize the panel and then we can also delete the panel by clicking on the drop-down box there and clicking on delete this panel and the panel will be deleted. Next we're going to take a look at the recent alerts and messages. Here we can see in the red where it says important messages this is either your bulletin. And then you have your alerts along with your mail. So first we're going to go to manage alerts. Under manage alerts we're going to go in and add and change and delete account alerts. So here we have three types of alerts: we have account alerts non-account alerts and custom alerts. First we'll take a look at the account alerts and we go here click on the drop-down box and select one of my checking accounts. Click on go. Then we have our accounts with the alerts. So first we have our balance and activity alerts, transfer and payment alerts, stop payment alerts and wire transfer alerts. First column here we have the name of the alert send to that tells us that the alert is turned on or turned off. It will also tell us if it's turned on where the alert is going. Here you can see that we have an email address here. Over here are my options to change, delete, or add. I'm going to go here and add the ACH approval pending alert. Here I have the options, I have both of my email addresses listed here so I can select one or both or none, and I can still add the alert. If I don't select an email address it will go right to BeB, or I'm sorry, business online banking. Also, you will be able to receive a text message alert. And you will have your cell phone number will be added about right here and you just click on the box and you click on add alert. I wanted to go in and change the alert just click on change. Maybe I'll add the email address here and then save the alert. Next we have non-account alerts. And these are alerts such as the email address has been changed, telephone number change, password has been changed, and these works the same way as the account alerts. You can add change and delete them from here. Next we have custom alerts. Custom alerts allow you to customize alerts that you want to set up on your business online banking account, so here I click on add alerts this is the existing alert that sets showing here. I'll click on add new alerts, I would type in a subject the alert message and that message is just for me, and then send to where do I want the alert to go. So I'll send it to an email address there and then we have our frequency listed here and we have several options for the frequency, and you can also customize the frequency. So here I just added a date and then I can add additional dates. Once I get all the information completed here, I will click on add alerts. And then you've added a custom alert. Now if I go to mail and alerts here, this shows me all of my alerts and mail that I have. So here we have the date that it was received, status, either read or unread, and the type. Here we have all alerts. Here's one item that's mail, and it tells you where it was sent from and then the subject. If you want to see the alerts just click on the hypertext link. We can read the alert and then we can delete it, or we can go back to receive mail and alerts. And next we're going to talk about the administration information. So here under under the administration tab we have company administration and self administration. The two that we're going to be taking a look at today under company administration we'll be taking a look at managing users and then we'll take a look at self administration. And I do want to remind you all that the company administration function must be performed by the company admin before additional users can access any accounts or features, so what we're going to take a look at next is how the company admin would add new users. So under company administration, we'll go to manage users. And then we come to the user administration page. Here we have the option to create new users, and we would do that by clicking on 'create new users,' but before we do that I do want to go over how to unlock a user. Here's our existing users. So here we have our user ID, first name, last name, the status and then system access. So here we can see under our status that we have active, we have most of our users as active, and we have one that's live. Let's talk about how to unlock this user. Go to system access, unlock the user, I will just click on the check mark that's there, and then click on Save Changes. Now we can see that our user is no longer live. Now if we go back into system access, let's say that the user has forgotten their password. You can go in and change their passwords you will give them a temporary password. And it tells you here the password criteria for the temporary password. The password is not case-sensitive, has to be 8 to 12 characters, it must contain at least one number and one letter, and you also want to make sure that you uncheck the user locked option. Here I'm going to go ahead and lock my user again and save the changes, and you can also go there if you know that a user is going to be out of the office for a period of time. You can lock that user so that they're not able to access the account until they come back. So now let's take a look at creating a user. So if I click on create new user, I'm going to give my user a user ID, password, first name, last name, primary email. The secondary email field is optional, and you would add your users telephone number. You can add up to six telephone numbers total. If I wanted to add another phone number I click on the label here. And then continue. Now we come to the roles here. Now we also have this option here to copy an existing user, and that is the demonstration that I'm going to go over today but I will discuss that's the difference between copying a user and adding a new user (not copying the user as we go along). So I'm going to go ahead and copy one of my users. Once I select copy user I'll click on select user, select my user from the list. Click on copy user. As you can see here the user roles has auto-filled because this is what the existing user that we're copying, these are the roles that were assigned to that particular user. So the user roles are: allow this user to set up templates, allow this user to approve transactions, and grant this user administration privileges. Then I'll click on continue. Next we have services and accounts. This is where we would go in and add the services and accounts. I'm going to go to internal transfer and click on change. So here what you will be doing, so here's what this existing user already has set up for them. So for internal transfers, they can use all of these accounts that are listed here for internal transfers. It can entitle from the account, entitle to the accounts, and allow transmit is for approving (so they're able to approve) internal transfers for all of the accounts listed. Once you go in and you select the accounts, I'm going to click on Save Changes, and then you would go through and add any other services and attach accounts to those services that you want this user to have. Then we'll click on continue. then the ACH account limit. Then we come to our wire limits. The company's daily wire limit is set at 1 million dollars and then we have our wire services listed here. This user right now has a limit set for 1 million for all of the services. And then down at the bottom we have the accounts listed, and then on the accounts we can put a user individual transaction limit and we can also put a user daily account limit. For example, I can put $10,000 for the self accounts under the individual transaction limit and then for the daily limits for the account I'll put $50,000. So now the user has a transaction limit of $10,000 for this particular account and a $50,000 total daily limit. Then I'm going to continue. So we come to the new user verification screen. We want to go through verify the information that's here if you find that there's something that needs to be changed or edited, you can click on the links on the right hand side of the screen here, and you just click on those links go in and edit the information. Once you've done that you're going to come back to this screen and click on submit. Now we can see here under user status that our user is now active, so this user is now able to log in to business online banking. I do want to emphasize that it is the responsibility of the company admin to add new users so that they are able to access business online banking. Next I'm going to go back to the welcome screen. Under the administration tab we're going to go to self administration. Self administration allows you to change your own password, set up your personal preferences such as your email and telephone numbers, and also manage favorites that will appear in your favorites panel shortcuts. So under self administration, click on change password it allows us to go in and change our password. You add the current password and then the new password and you have the password criteria listed here and then confirm the password and then save. Next we have manage contact preferences. This allows the user to go in and update their email address and telephone numbers. Then manage favorites. Here this allows you to add favorites. You can add up to five favorites. I can just come down here click on the favorites that I want to add, 'add favorites,' and then to delete. Just delete the favorites. I'll go back to the Welcome page now. Here you can see that your favorites are going to appear in the shortcuts panel. Also I do want to talk a little bit about the calendar here. You can see where the dates are highlighted they are green on my screen. I click on the date it just means that there's an activity going on there, so I can see that there's lots of scheduled requests for the 8th, and then there's also a custom request. So if you want to see what's going on for that day just click on the date. And then next we have our online help feature. Now when we use the help feature that's located at the top here, this is mobile this is for all of the business online banking. Click on help and then we have our Quick Links here: How Do I, the glossary, then frequently asked questions. If I click on How Do I, I will receive related topics here. If I click on account alerts, this brings up information on how to add alerts and delete alerts and change an account alert. You can also print this page. You can print from this page by clicking on 'print this page.' You can also copy and paste this information to another document. Next we have the glossary. In the glossary you'll see terms. Different terms are listed in alphabetical order. And within these terms you'll see that there are some additional information or additional terms that might be tied to the term that you're looking at, or that you're reviewing. Now we're going to take a look at another way to use the help feature. So right now I'm on the manage alerts page. If I go down here to the bottom and click on 'How Do I' this brings me up information on account alerts, because that's the page that I'm on. It works the same for the glossary and the frequently asked questions. So with the glossary you should see the terms that are related to account alerts and the same with frequently asked questions. Next we're going to take a look at reports. The two reports that we're going to review today are the balance report and the activity report. So under the reports tab, we're going to first take a look at the activity report. Here we're going to select our criteria. So first we would select the output. I'm going to select screen. And then we're going to select the accounts that we want to run on the reports. Over here you can change the view. I click on the drop-down box here if I just wanted to see savings accounts I click on savings accounts and go. Then it brings up my savings accounts. I'm going to select all accounts, and then we have date range options. You can select a specific date, we can select the range, from and to, previous business date or since last download. And then we have our transaction types, we can select all transaction types, all credits, all debits, or we can go with the selected group, credit or debit. Down at the bottom here we have transaction codes. Here you're able to select the transactions, specific transactions, that you want to see and move them over. So I'll just select them and move them over to selected. Here you can select up to 25 transaction codes. Then we have display options. Account sort, so how do you want the reports sorted. You can go by account number, description, ABA number and account number, or ABA number and description, and you can include transaction detail, you can include subtotals for selected transaction groups, and you can also display totals by date for the selected date range. Next we have the advanced search options, which are optional, so you can also search for information regarding an amount. So if you're looking for a specific amount you can put in the exact amount or range, and also you can also search by serial number (check serial number) you can put the exact number in or a range. You can also search by description. I'm going to go ahead and generate the report. Here we have our activity report. Here you're able to download the report. Click on the action here, and then go. I can also print the report by clicking on 'print this page' and I can print the report from here. Now here on the report, if you have an image of something and you would have a camera here under the image column. If you click on that picture of the camera, you would be able to see the checks, the check image, and the deposit slip. Next we're going to take a look at the balance reports. I'm going to go back to the reports tab, click on balances. I'm going to go in and select my criteria. So select your output, select the account, your date range, either a specific date or range or previous business day, account sort, (you have the same options listed here), and then summary information. You can select all summary or specific information. And then generate the report. Now here we have our balance reports. Again you can print the page and you can also download the report. Keep in mind with the reports that these are your reports as the user, so if someone else wanted to see the same report that you're looking, at you would have to share the criteria or download the report and send it to them. Next we're going to take a look at transfer. So here we're going to go to the transfer and payments tab, and we're going to be taking a look at internal transfers and multiple transfers. We'll start with internal transfers. First I'm going to click on transfer money internal. We'll select our from accounts, and we'll select our to accounts, type in our amount, and we can select our frequency. As you can see you can put this on a schedule if you'd like. There are all the frequencies that are available, and then click on continue. Now here if the user is entitled to approve transactions they can click on transmit to approve this transaction, or if they're not entitled (they don't have the entitlement to approve) they would only have submit for approval. We'll go ahead and transmit and we get our transfer confirmation. Now if we would have submitted it for approval it would go to approve transfers internal, and then from here we would select the transaction. Click on continue and then approve the transaction by clicking on transmit. Now let's take a look at multiple account transfers. So we'll go to multiple account transfers, transfer money manage templates. Now to use this feature you will have to use a template (it requires a template). So first we'll take a look at adding a template. Down below here we have our existing templates. We're going to add a template. Give our template a name. And we have our actions here debit and credit. So debit, if we select debit the total transfer amount is deducted from the main account and transferred to the detailed account. So we're going to add our detailed accounts down here and for credit the total transfer amount is deducted from the detailed accounts and transfer to the main account. I'm going to select debit. I'll select my main account from my drop-down then I'm going to add my maximum transfer amount and that's for detail accounts. The description field is also optional and we're going to come down and add our detail account. I'm going to click on the drop-down box select my account. I'll add a few, click on additional (add additional) accounts. Now I'm going to add templates. I can also here set all default amounts to - so if I type an amount in here click on change it's adds it for all. Click on change here it adds in an amount for each account, and I'll add the template. Now I am at my template confirmation. So here now that my template is been created, I have the options to transfer money using this template or transfer money using an existing template. I'm going to transfer money using an existing template. Again, here we have all of our existing templates, and I'm going to use the template that I just created. I'm going to select it. Continue. So here's the template that I created if I wanted to go in and change any of these amounts I can do that. And then continue. And now again, if this user is entitled to approve transactions they'll have this option here. If they're not entitled to approve they'll only have the submit for approval. If they do have the entitlement to approve they'll have both options here. I'm going to go ahead and transmit. And I get my transfer confirmation. Again, if we wanted to go in and approve any multiple transfers, we go to approve transfers multiple accounts, and then we would go in and select the ones that we want to approve, and then click on continue and then transmit. The next feature that we're going to take a look at is stop payments. The stop payment requests are processed from the account services menu. Under stop payment we will go to stop check payment. You are able to stop payments on a single check or a range of checks, up to fifty. First we'll need to select the account. We can type in a reason here, but it is optional, stop a single check, add the check number the date on the check, the payee field is optional, and so is the amount. Now we're stopping a range of checks we would select stop a range of checks and we'll put in the first check number and the last check number and then continue. Verify Stop: so here we just want to verify the information that's here, and then submit the request. If we find that this information is not correct, then we would just edit the request update it, and then submit the request. So here's the stop payment confirmation. Now from here we can add a new request, or we can view existing stop payment requests. Here we would select our account, or accounts. Here we can select a specific date or range, and generate reports. Then we have our existing check payment stops. You have the check number, the account, payee amount, submitted, expired, and then they're also able to (the user is also able) to cancel the request. Okay wires are available under the transfers and payments menu. We have wires here. We have two options available in order to process wire requests. There's the one time entry and that information is not available for future use, and then you can use the template and that can be used in the future. So first let's take a look at one time, the one time entry option. So we clicked on wire money. We come to this page here and this is where we will enter our information for the wire. I do want to add at this point though that out-of-band authentication is required for ACH and wire approval. So here we're going to click on the drop down box select our type of wire. And then the template name. This is optional. If I add a name here I will be saving the template because this is a one-time I'm not going to add a name here. So we click on the drop-down box to select our account, and we select our send on date, the amount, type in the amounts and then continue, and we come to the add recipient information. Here we're going to add the routing number which asks for the bank ID and there's two ways that you can do that. You can add the routing number here and click on bank ID validate, and then it will autofill the bank's information here. Now we can also go in if we don't have the routing number we can click on bank ID search and we can search for the bank. The options to search are by name, state and city, or ABA number. So here if I type in the bank name, I'm going to remove this exact match on name and then search. I can select it from the list, and then it would add the information. Next we want to add the recipients account number, recipient name, recipient address. Additional information will go here. The intermediaries would be in these two fields if you have an intermediary to add, and we come down to the wire initiator information that will autofill. So we'll click on continue. You want to verify your wire information here, and then we can transmit or submit for approval. Now here when I go to transmit, remember that you will have to use the out-of-band authentication. And then you'll have your wire confirmation. Next we're going to take a look at wiring money via templates. I'm going to go here in my menu to manage wire templates. I'll select my template here. This gives me the template detail, so to wire money using the templates we are going to go to 'wire money via templates.' And then from here we have the option to select the templates that we want to use, add an amount, additional information if needed (it is an optional field), frequency. So here if we wanted to put this the wire on a frequency, I can go out with weekly, and then I have these options for the send on date. When do I want this to start? And then end on. I can continue indefinitely, continue until a specific date, or I can continue for a number of occurrences. Then you have your processing option. Use the next processing date if the scheduled request falls on a non-processing date, or use the previous processing date if a scheduled request falls on a non processing date. And we're going to go to continue, and then you want to verify your information that's here. And then approve or submit for approval. And then you'll have your wire confirmation here. Now the last one that we're going to take a look at is wire money via multiple templates. This allows you to wire money using multiple templates in one transaction. So here we would go and we would select from the drop-down box the templates, we type in in our amount, and then our date. And as you can see here we can keep adding. Once I use all these up I can add more requests it will get open up five more lines for me and I can just continue on and on so I can add as many templates of that type. Then I click on continue and then again I have the option to approve or submit for approval. Now if we wanted to approve wires, we go to the approved wires. And then if there were any here that needed to be approved we would select it just like we've done previously for ACH and internal and multiple wires. Select it and then you would click on continue and then approve. Also keep in mind that alerts can be set up for wires so if you are set to receive a wire or receive an alert for an approval, you will be notified of a pending approval. And keep in mind you will have to set those up manually. Next we're going to take a look at the ACH function. So here we're going to go to transfers and payments again, make ACH payments. Now we can see here that we have make ACH payment and we also have collect money via ACH. So here this works the same. We can send a one-time ACH, or we can create a template. We can also put it on a schedule, so we have several options here. First we're going to take a look at creating a template, and as you see here these are all of our existing templates listed here. So first let's go ahead and create a template. Give our template a name. We'll select the request types, select our company name/ID, templates description (and this is a required field). We're going to select our debit accounts, maximum transfer amounts, and then continue. So here we are going to add the credit destination accounts, we're going to add the routing numbers, account number, checking or savings, name, detail ID is optional. We'll add an additional role. Remember we can go and do an ABA search. Search by name. Add bank, and then it's added. Add my account number, checking or savings, I'll add one more role, and I'm going to save the templates. Template confirmation page comes up: "the following template has been saved successfully." Now I have the options up top here: 'send money using this template', 'send money using an existing template,' and we can also view your ACH limits. That's the users ACH limits. I'm going to go to 'send money using an existing ACH template' and I'll pull my template from the list here with March 7th. Click on continue. Here I can go in change the effective date or leave it as is. Then I need to go in and add my amount and continue. Verify payments screen comes up I want to verify the information that's here and submit for approval or transmit. I'm going to go ahead and approve, and I get my payment confirmation here. Now collect money via ACH works exactly the same way. So we're going to go back to make ACH payments. So we're going to take a look at see at setting up a template for pay federal taxes. Keep in mind that you must also if you're going to be using business online banking that you'll still need to be registered with the IRS. So here I'm going to use an existing template that I have for federal taxes here. So here I would select the name of the template federal tax (federal taxes) and then the request type and this is going to be a drop-down box and you would select federal tax from from the drop-down box. You'll select your tax payer name/ID, give your a template of description, select your debit account, and then add the maximum transfer amount. Then down at the bottom you'll need your tax information available so you can complete this information. You would add the routing number, account number, checking, and then the tax ID number. And then you would go in and add the tax type but you click on the link there select your tax type, your tax types, and then it will fill in here. And then your subcategories. You can also add additional rows of information. Once you've done that you'll want to save the changes. I'll send money using this template. Go in and verify my information, add any amounts in here, and then click on continue. And then from continue we would approve it. Call our Customer Care Center toll free at 877-722-6243 or 207-284-4591.